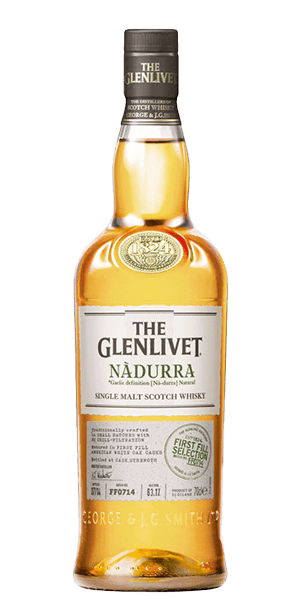 Glenlivet Nadurra is a “natural” dram, so simple, straight forward and refreshing that you just want to hug the Whisky master who came up with the idea. George Smith was running an illegal still on the estate of the Duke of Gordon in the wee early 1800’s. The good old Duke ... ahem ... may or may not have been aware of the illicit operation in exchange for a personal supply. When the Duke helped sponsor legislation in 1823 that made Whisky distilling legal in the UK, it just so happens that George Smith was the first one granted a license. Now legal and above board, he naturally named his “new” business after the local parish—Glenlivet. Today Glenlivet is one of the “Big Three” single malt producers, being #1 in the United States and #2 worldwide. Their Whiskies are officially “Speyside,” meaning that they are Highland malts produced along the river Spey, and the water for the Whisky mash comes somewhat famously from “Josie’s Well.” Glenlivet produces Whiskies in a variety of ages and wood-matured combinations, and the remaining spirit not bottle as part of their Glenlivet lineup is considered an indispensable component in some of the most famous blends. In Gaelic, Nadurra means “natural,” but NOT in a new-age hippy-dippy politically-correct organic free-range kind of way. Some wonderful whisky master at Glelivet said, “Hey, why don’t we just make a nicely aged, clean, pure Whisky without fancy used casks or flavoring.” Whoever that guy was, I want to shake his hand. The Glenlivet Nàdurra First Fill Selection is drawn from never before been used casks of American White Oak. Bottled at cask strength this beauty gets a great combination of flavours because of this technique which was used by Glenlivet back in the 1900's. This is one of the purest Glenlivet's available today! What does The Glenlivet Nàdurra First Fill Selection taste like? The Flavor Spiral™ shows the most common flavors that you'll taste in The Glenlivet Nàdurra First Fill Selection and gives you a chance to have a taste of it before actually tasting it. Nice bite right out the gate. Love the banana! Love the strength, good for sipping. Outstanding. Very smooth with a slightly spicy bite at the end. Long lasting aftertaste that is wonderfully enjoyable. I was very surprised at how complex this bottle was. Great buy for under $100. Also I don't usually add water to my scotch, but it's a must for this bottle. Instantly has become 1 of my favorites. Can never go wrong with Glenlivet, very pleased with this one. I enjoy it neat. Fantastic, as perfect a Scotch as you can find. Will become one of your favorites. Sweet, smooth and a good burn. Very strong but tasty. Good to have in the bar, but not a Gotto bottle. Very strong and sweet flavor profile... and light very light on the peet. Has a nice little bite on the backside. We love this stuff! Fantastic and remarkably smooth. Glen Livit is a personal favorite. one of my favorites! Its always a lovely smooth finish.